An Ethiopian professor of political science based in the United States says Ethiopia finds itself at a crossroads with an uncertain future unless the government holds free and fair elections. This, as tens of thousands of people in Gonder, a city in the Amhara region of northern Ethiopia, protested Sunday calling for a change of government because of what they say is unfair distribution of wealth in the country. Getachew Metaferia, professor of political science at Morgan State University, said the root causes of the Gonder protest and the Oromia protests of last year can be found partly in the Ethiopian government’s ethnic-based federalism policy. “The first one is ethnic-based federalism that has created a dichotomy situation let’s say between Amaras and the Oromos, the Oromos and the Tigray. The second is the expansion of the territory of the Tigray people to include an area called Wolgait-Tegede in the Gonder region where the uprising is taking place right now. The people in Welkait-Tegede say that they are Amaras and not Tigrays. So, they should not be incorporated in the Tigray region,” he said. Metaferia also said another cause of the uprisings in Ethiopia is what he called the worsening democracy situation in Ethiopia. “There is no human rights protection, no freedom of speech, freedom of the press,” he said. He said another reason for the uprising is the widening gap between the haves and have nots. “There is poverty, abject poverty. There a few elite people who are benefiting. 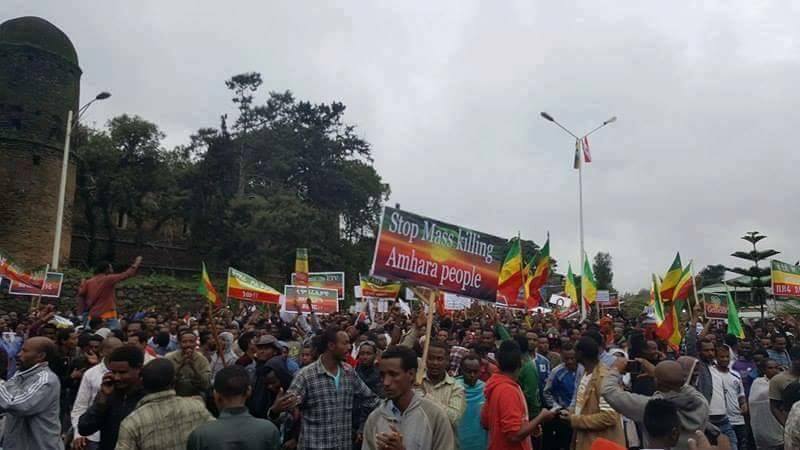 The head of the Amhara Regional State government communications office, Ngusu Tlahun, spoke to Ethiopian television and said the town and regional state governments would address the demands made by the protestors on Sunday concerning development and good governing. 'The problems would be corrected and solved in time," he said. However, he said the protestors had carried a flag that he said did not represent the one recognized by the Ethiopian constitution. Professor Metaferia said another source of the protests could be the Ethiopian government’s use of force against protesters in the name of fighting terrorism. “I can also say that the heavy-handedness of the government, using a special force called Agazi. A semblance of resistance, a semblance of opposition leave someone to be killed by the Agazi force. So this is the government that has created more or less a police state. These are the root causes of the situation taking place in Gonder,” Metaferia said. Metaferia said he sees no peaceful future for Ethiopia unless the government mends its policy to incorporate all Ethiopians rather than use the divide and rule technique. “What do you expect from a government claiming 100 percent seats in parliament in spite of this popular uprising? Opposition leaders are in prison. So, with that kind of situation there can be no peace in the country. Hopefully the government’s foreign friends will strongly advise the government to open and let there be free and fair elections,” Metaferia said.